Master loves to disturb me when I'm fast asleep. She says I look ultra cute when I am dreaming about kitty snacks, do you think so? Take a closer look, I won't bite! See how mad I get when Master disturbs my cat nap? Happy Fluffy Friday! Today you on time :D Yay! Wui, that stare can be a killer la ... LOL! hahahah... her eyes jadi juling.. lol!!! You tau I forgot that today if Friday, nasib baik lepas suboh I tak tidor balek, ada tuition at 9.00am - 11.00 am. I dah grab the code, Insha' Allah lepas habis kerja nanti, I will post it tak lah simpan sampai 2 hari kot, I will try my best tonight and will alert you, ok? Happy Fluffy Friday to you, all members and viewers. Oh my Phoebe you are so cute. I could just steal you. You are a perfect fluffy Fri. Have a great week end. happy FF from Tita GG! 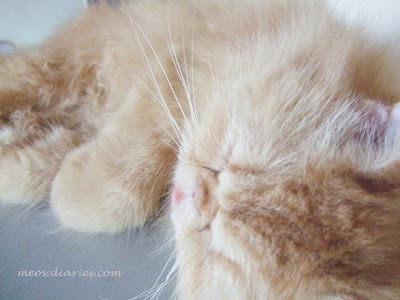 Pheebs,,scratch la furnitures of master now..hahha..
Phoebe is ULTRA CUTE indeed when sleeping! This is one of few times where a good pic of a cat can be taken when they're sleeping! Thank you for visiting my Fluffy Friday post and correcting my link. It doesn't get much cuter than a sleeping kitty! :* :* :* ELai Meow 1! Ha ha but still so cute! Hi Lil! Thanks so much, love da toy compliment for Phoebe he he, just makes my day! Cause I oso think dat way sometimes, memang geram! =-O =-O =-O :-[ :-[ :-[ :-[ HE he!